This article makes the point, like all major industry process and/or technology initiatives, that a whole new group of metrics will be developed to facilitate and monitor the “capabilities” and “readiness” of products and processes to perform in the age of the Industrial IoT [IIoT] and IoT. Most recently, we saw this happen with intellectual property as the channels to monetize it came of age. 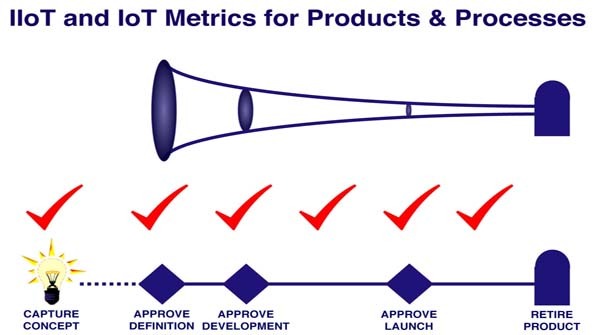 Metrics for IoT in the Product Development Process [Machine Design – January 2017] addresses the various types of new metrics that will arise and evolve in the years ahead, offers some specific examples of new IIoT/IoT metrics, and identifies several companies we consider to be the early industry leaders. This entry was posted on Thursday, January 12th, 2017 at 10:15 pm	and is filed under Blogroll, Finance, Metrics, Process, Strategy. You can follow any responses to this entry through the RSS 2.0 feed. You can leave a response, or trackback from your own site.